HomeSecure.ie are proud supporters of LauraLynn, Ireland only CHILDREN'S Hospice. LauraLynn, Ireland’s Children’s Hospice was formed in 2011 and is Ireland’s only Children’s Hospice. 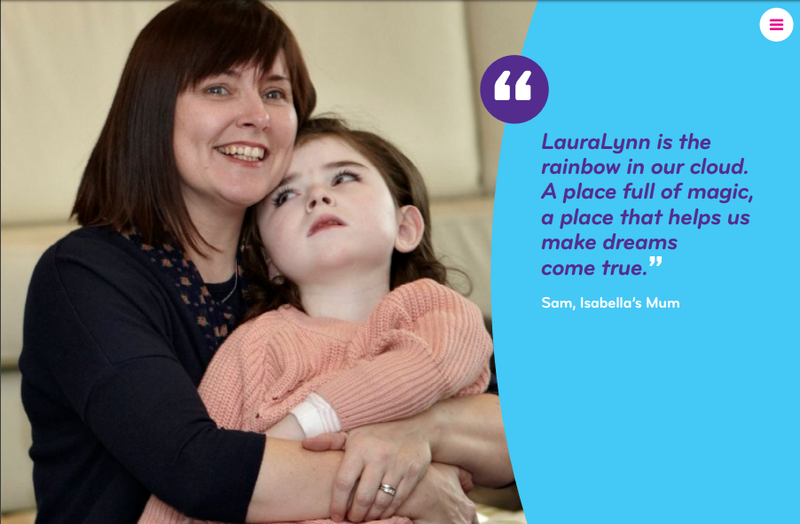 Striving to make every moment count, LauraLynn offers specialised palliative care to children with life-limiting conditions, their parents, brothers and sisters and extended family, in a home-from-home environment. As a charity partner, HomeSecure is offering all new customers the facility to add a €1 donation to their monthly bill which HomeSecure will match as part of our One-For-One campaign for LauraLynn. The total €2 will go directly to LauraLynn each month. As a rapidly growing Irish business, our ambition is that our €2 donations will quickly accumulate into several thousands of Euro, every year, going to a great cause. By partnering with our customers we’re aimming to make a big difference to LauraLynn and Ireland’s sickest children. We guarantee that the full €2 monthly donation will go directly to the LauraLynn Hospice. LauraLynn Children’s Hospice provides special palliative care to children with life-limiting conditions and support to their families. Caring for a child with a life-limiting condition, impacts the whole household, so it is vital that there is individualised care and support on hand for the whole family unit. LauraLynn’s hospice service focuses on enhancing quality of life, which includes physical comfort and wellbeing, as well as the emotional, social and spiritual aspects of care of the family. LauraLynn support families through the course of the condition from the point of diagnosis to crisis, end-of-life care and through bereavement. Children’s palliative care is a roller-coaster journey for families. Learning that your child has a condition with no cure is devastating. It is a time when families need care, support and information so that they don’t feel isolated. LauraLynn aim to keep families together and allow them to be Mums and Dads and not nurses or carers. They are deeply committed to each child and family as a whole. As their needs change, they provide tailored, expert care in a home from-home setting or in their family home. LauraLynn always aim to focus on the positives, giving the children the most enjoyable time possible. They completely break the trend of what you expect a hospice to be. There are approximately 3,840 children living in Ireland with a life limiting condition, about half of whom have palliative care needs. In 2017 LauraLynn worked with 246 families, providing 1,286 short stays to families and 899 home visits. LauraLynn operates to a ‘Triple Lock’ charity standard. To learn more about LauraLynn’s governance here.